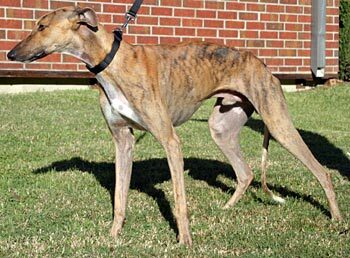 Wylie, aka Wild Yard Metal, is a skinny, brindle, 1½-year-old male born January 20, 2008. His sire is Hallo West Acre, and his dam is Kay Cari Pennys. 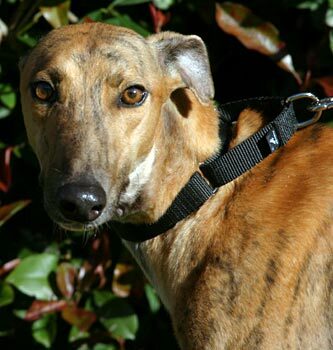 GALT received a call on October 29, 2009, from the Executive Director of the Texas Greyhound Association, asking if GALT could take in 3 strays that were just picked up in the Waco/Hillsboro area. Wylie, along with Mr. Big and Amber, was picked up by a GALT volunteer within several hours of the phone call and taken immediately to VCA Preston Park Animal Hospital. 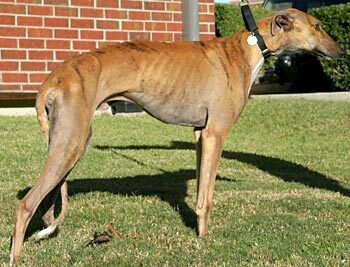 Wylie was very thin, weighing in at only 54 pounds. He has now put on weight and is ready to find his forever home! It is not known at this time if Wylie is small animal or cat tolerant.